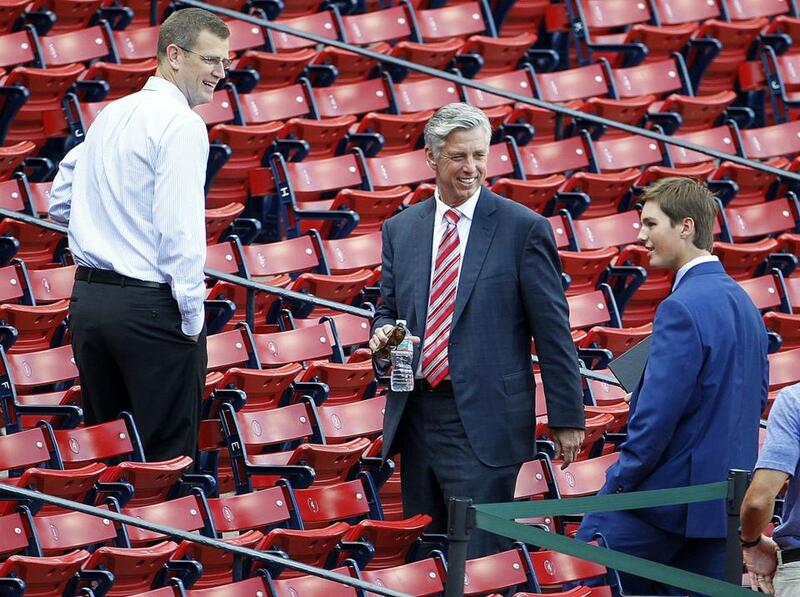 Dave Dombrowski was joined by his son, Landon, and Red Sox executive Sam Kennedy at Fenway Park in August. Late in the fall of 1978, as New England mourned another grievous climax to a Red Sox title quest (oh, Bucky Dent), a college math whiz living with his blue-collar parents on the southwest side of Chicago took another step on his long journey to gaining control of the baseball operations on Yawkey Way. At 22, Dombrowski demonstrated that he grasped the perils of building a major league baseball roster, a challenge he had informed his eighth-grade classmates he one day would embrace. His thesis examined the “potentially transient’’ life of a baseball executive buffeted by unforgiving fans and bottom-line owners. In every respect, Dombrowski would become the man in the middle, which is all he ever wanted. It’s hard to imagine a better nucleus of young talent in the AL than the one wearing Red Sox uniforms. Now, as he tries to restore luster to a diminished Red Sox franchise — he last month was appointed the first president of baseball operations in the team’s 115-year history — Dombrowski is guided by the wisdom he has gained since he began scouring newspaper box scores and transaction summaries as a child. “It’s like he was born for this,’’ said Bo Gutzwiller, a childhood friend. The son of a day-shift auto parts manager and night-shift billing clerk, Dombrowski is a multimillionaire now, married to a former television sports reporter who fought sexual harassment at ESPN, the father of a girl-band rocker and a budding prep school baseball star. He is ensconced in a first-class Boston hotel and is hard to miss as he strolls between the ballpark and his temporary lodging, looking every bit the tall, silver-haired dignitary in his fine suit and tie. In the new phase of his transient life, Dombrowski will spend his first year in Boston living alone. Even before he was blindsided last month when Tigers owner Mike Ilitch fired him after their high-payroll team dropped 11½ games back in their division, Dombrowski and his wife, Karie, had expected his 13-year run as Detroit’s baseball decision-maker to end when his contract expired after the season, he said during a recent Globe interview in a luxury suite overlooking Fenway Park. No matter where Dombrowski landed, the couple decided, Karie would stay in their Bloomfield Hills, Mich., home until their daughter, Darbi, a member of the teen band By The Way, finishes her senior year of high school and departs next year for her mother’s alma mater, the University of Oklahoma. Their son, Landon, a college baseball prospect who took batting practice in Detroit from the likes of Triple Crown winner Miguel Cabrera, will begin his sophomore prep year in Michigan before they decide whether he moves to New England for the spring baseball season. Until then, Dombrowski starts most days by stopping at a Dunkin’ Donuts near the Fens. Known throughout baseball for his cordial nature, he has yet to recoil at approaching strangers. “Hey, Dave, welcome to Boston,’’ one after another tells him. Then he heads to Yawkey Way, a roster repairman shaped both by his old-school Chicago roots and decades of high-stakes competition to secure and develop the game’s best talent. In some ways, Dombrowski remains connected to an era when Bill James, the godfather of statistical analysis in baseball, had only begun to change the way teams build their rosters. Dave Dombrowski said he has only once confronted a team in a closed-door clubhouse meeting — the 2002 Detroit Tigers. He fired the manager early in the season and replaced him with bench coach Luis Pujols (rear). In the modern heyday of mobile computers, Dombrowski keeps his daily records — scouting notes, trade ideas, appraisals of his newly inherited Sox players — on 3 x 5 index cards, as he has done since he entered the baseball business in 1978. The difference now is that he tucks the cards into a sleek leather folder he carries in his portable “office’’ — the inside breast pocket of his sport coat. He also keeps stacks of index cards on every good player in every major league organization. Dombrowski’s old-school methods have sparked some criticism of his ability to adapt to contemporary practices. In the alphabet era of quantitative analysis — WAR, UZR, UBR, BABIP, and DIPS — a period when Sox principal owner (and owner of the Globe) John Henry has proven to be a king of “quant’’ in his various business ventures, Dombrowski has been seen as lagging. Even his Tigers successor, Al Avila, who worked with him for 23 years, suggested after Dombrowski’s firing that he had not sufficiently relied on advanced statistical analysis, despite building teams that won four straight division titles and twice reached the World Series. Dombrowski attributed his relatively small analytics staff in Detroit to budget concerns. He said he has been committed to integrating statistical analysis into baseball operations for as long as he can remember. And there is little he doesn’t remember, since he possesses nearly a photographic memory. Dombrowski remembers vividly, for instance, how his honors thesis became the gateway to his baseball career. In researching his report, Dombrowski interviewed several top executives, including renowned White Sox general manager Roland Hemond and former Sox interim GM Mike Port. In Hemond, Dombrowski found an instant mentor. If you want a front office job, Hemond told him, attend the 1977 major league winter meetings in Hawaii. Dombrowski scraped together the plane fare, and when he reached Honolulu, he made for the beach, then phoned Hemond. He was 21, caked with sand and dripping wet when Hemond invited him to his hotel suite to meet Paul Richards, a senior adviser to legendary White Sox owner Bill Veeck. “I just need to shower,’’ Dombrowski said. “We don’t have time,’’ Hemond told him. 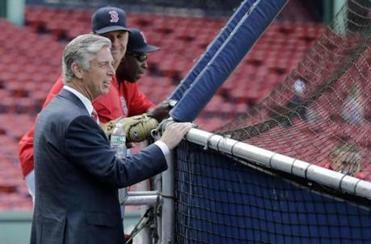 Damp and sandy, Dombrowski arrived for a meeting that would set the course of his life. Veeck would offer him $7,000 to become an assistant minor league director, or, as he recalls it, “a glorified gofer.’’ His father urged him to push for a bigger paycheck, and Dombrowski walked away from his first contract negotiation with an $8,000 annual salary and the job of his dreams. By then, Dombrowski’s playing days had passed. Although he was an all-conference first baseman at H.L. Richards High School in Oak Lawn, Ill., he was a better football player, an all-conference defensive tackle who was widely recruited by small colleges, particularly Ivy League schools. Getting admitted to a top-flight university posed no problem. Dombrowski was president of his school’s National Honor Society and a member of the Mu Alpha Theta fraternity for elite math students. His leadership skills were so highly regarded that he captained both the football and baseball teams, and when his baseball coach needed to skip an hour of practice every day to teach a late class, he entrusted Dombrowski to run the sessions. The practices ran smoothly, despite the mischievous impulses of teenage boys. All the Ivies came calling, and Dombrowski settled on Cornell in part because of his comfort with the football program. Still, he flirted with playing baseball. Trying out for one open spot on Cornell’s roster, he found himself standing shoulder to shoulder with the coach, who pointed to a distant spot beyond the field. “Can you hit a ball that far?’’ the coach inquired. At which point, Dombrowski recalled, the coach informed him that only one person had hit a ball that far. He played for Columbia. His name was Lou Gehrig. Dombrowski returned to football. But his Cornell days soon were done. When an administrative snafu threatened his sophomore financial aid package, he pleased his mother by transferring closer to home, to Western Michigan. He was a few credits shy of graduating when he accepted the White Sox job. But the school created an independent study program for him, and while Dombrowski completed his college requirements, his baseball education fell to Hemond, a front office sage whose experience dated to working for the Boston Braves in the 1950s. At first, Dombrowski’s most important assignment was operating the electronic scoreboard at Comiskey Park. Hemond set the bar higher. He trained Dombrowski for an executive position by exposing him to every facet of the White Sox organization. Dombrowski rode buses with minor leaguers and traveled the backroads with scouts. He sat with Charlie Lau, one of the game’s elite batting coaches. He attended daily meetings with Veeck and other top executives, and on Hemond’s advice, he learned Spanish and toured Latin America with White Sox scouts. He also connected with Tony La Russa, a rookie minor league manager in the organization who would go on to the Hall of Fame. Soon La Russa was the club’s major league manager and Dombrowski the minor league director. At 26, Dombrowski became responsible for making the franchise’s selections in the 1983 amateur draft, an experience memorable for one of his greatest mistakes. The White Sox possessed the 13th overall pick, and when it came Dombrowski’s turn to choose, he held two index cards, one for Joel Davis, a high school pitching phenom in Florida, the other for Clemens, a junior at the University of Texas. Dombrowski opted for Davis. Clemens, selected 19th overall by the Red Sox, went on to win 354 games, an MVP trophy, seven Cy Young awards, and two World Series. Davis won eight major league games before a shoulder injury ended his career. All Dombrowski can do now is shake his head. In fairness, nine other teams selected now-forgettable pitchers in the ’83 draft before the Red Sox chose Clemens. Dombrowski, undaunted, continued to rise with the White Sox, becoming Hemond’s assistant general manager as he refined his skills as a talent evaluator. The prospect batted righthanded, unlike Gehrig. But he displayed the kind of brute power Gehrig had shown in college. His name was Mark McGwire, a University of Southern California first baseman who would go on to hit 583 major league home runs in a career stained by his admitted steroid use. The Oakland A’s chose him 10th overall in the 1984 draft, too early for the White Sox to snag him. Soon, Dombrowski became so highly regarded in the baseball industry that by the time he was 28 the Seattle Mariners interviewed him for their general manager’s job. When the Mariners concluded he was too young, he returned to Chicago and, as it turned out, to a bitter fate. Trouble began when White Sox owner Jerry Reinsdorf fired Hemond after the 1985 season and replaced him with team broadcaster Ken “Hawk” Harrelson. Harrelson then cleaned house, firing Dombrowski, La Russa, and pitching coach Dave Duncan. “We got Hawked, all of us,’’ Dombrowski said. Dombrowski was “crushed’’ by the firing. After growing up a White Sox fan, he believed he never would work for another organization. Reinsdorf eased the pain by keeping him on the payroll for several months. Then Dombrowski found work in 1987 as director of player development for the Montreal Expos. Hemond promptly advised him to learn French. So Dombrowski enrolled in a Berlitz course and received tutoring every Saturday morning until he spoke French well enough to accept speaking engagements in Quebec’s official language when he became the Expos’ general manager — the youngest GM in the majors at the time at age 32 — in 1988. Montreal proved to be fertile ground for a young roster builder. It helped that Dombrowski hired Dan Duquette from the Milwaukee Brewers to serve as Montreal’s farm director, a move that put Duquette on track to become general manager of the Expos, Red Sox, and Orioles. Dombrowski also hired former Red Sox outfielder Tommy Harper, after Harper ended a difficult coaching experience in Boston, alleging the team racially discriminated against him. Harper said he shares the respect for Dombrowski that many in baseball bear. In Montreal, Dombrowski helped shape one of the best teams in modern times, the 1994 Expos. That club, under Duquette, surged to the best record in baseball, 74-40, before a player strike ended the season. Yet Dombrowski is also remembered in Montreal for giving away Randy Johnson, then a relatively raw 25-year-old lefthander. He is now a Hall of Famer, after finishing his 22-year career with 303 wins, five Cy Young Awards, and a World Series ring. Dombrowski explained his historic mistake by describing himself as a man in the middle. He said he was acting on Montreal owner Charles Bronfman’s mandate to win a championship in 1989. To appease Bronfman, he tried to beef up the Expos’ starting rotation by trading for Seattle lefthander Mark Langston, a workhorse who had won 34 games over the previous two seasons. The price: three pitching prospects, including Johnson. Langston performed well for the Expos, but they failed to make the playoffs before he departed via free agency after the season. Montreal also received two compensatory draft picks, allowing them to obtain Rondell White, who would become a productive major leaguer. But most baseball observers rank the trade among the worst of all time. Woody Woodward, the former Seattle general manager who effectively fleeced Dombrowski, warned against judging Dombrowski on a single transaction, no matter how poor the outcome, particularly when he was acting under pressure from an owner. When Dombrowski departed Montreal in 1991 to become general manager of the expansion Florida Marlins, his best years lay ahead. Tasked with building a franchise from scratch, he was backed by a free-spending owner in Wayne Huizenga and won a World Series only five seasons later, in 1997. 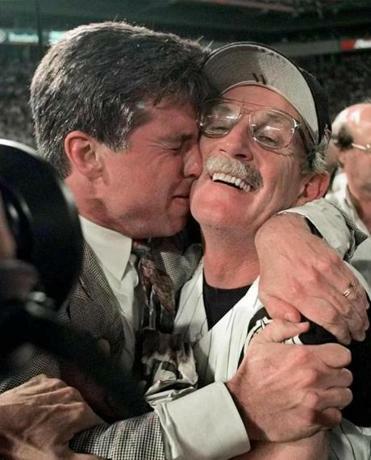 One of Dombrowski’s best moves proved to be hiring manager Jim Leyland, who later would join him in turning a long-depressed Tigers franchise into a perennial championship contender. Dave Dombrowski won a World Series in Florida after hiring manager Jim Leyland. Dombrowski’s other triumph in Florida was more personal. In a 1992 news conference to announce the signing of free agent catcher Benito Santiago, Dombrowski met Karie Ross, who was covering the event for a Miami television station. They dated secretly for a while. Karie previously had traveled the world to promote the American cotton industry after winning the 1981 Maid of Cotton beauty pageant during her junior year in the journalism program at the University of Oklahoma. The contest, sponsored by a coalition of cotton business interests, was held annually from 1939-93. When they became serious enough about each other in Miami to go public with their romance, Karie left the Marlins beat, amid criticism from other media members that her relationship with the team GM posed a potential conflict of interest. They married in 1995, in plenty of time to enjoy the ’97 World Series together, if only briefly. Four days after Florida’s dramatic Game 7 victory over the Cleveland Indians, Huizenga informed Dombrowski he planned to sell the team and instructed him to strip the roster of its highest-paid players. The fire sale began with Dombrowski grudgingly trading away the team’s best pitcher, Kevin Brown, and hitter, Moises Alou. 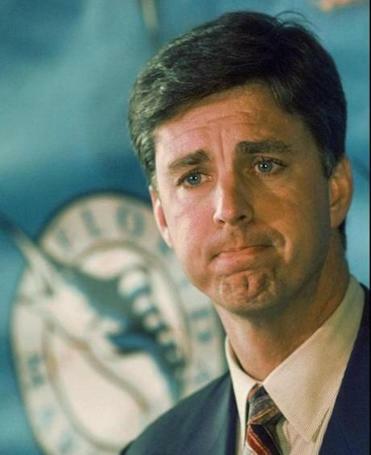 Shortly after his Florida Marlins won a title in 1997, Dave Dombrowski was forced to unload the team’s best players. As Dombrowski shipped away the Marlins’ veteran stars, he replenished the system with young prospects, including a sensational 16-year-old Venezuelan hitter, Miguel Cabrera. His rebuilding effort helped the Marlins win another World Series, in 2003, after Huizenga had sold the franchise to John Henry in 1999 and Henry had sold it to Jeffrey Loria in 2001 so he could buy the Red Sox. With Henry angling for the Sox, Dombrowski departed Florida after the 2001 season to become president and general manager of the Tigers. In Detroit, he encountered his thorniest makeover project. By the time Henry’s Red Sox had overcome 86 years of futility and won the 2004 World Series, Dombrowski’s Tigers were in the midst of four straight losing seasons, including a franchise-record 119 losses in 2003. The typically unflappable Dombrowski lost his temper trying to shake things up. 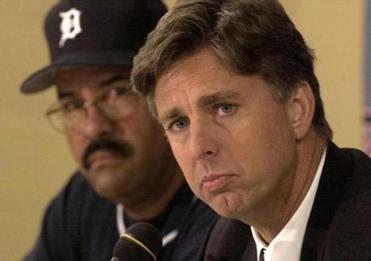 The Tigers had endured eight straight losing seasons before he arrived in 2002, and when they dropped their first six games of Dombrowski’s inaugural season, he abruptly fired manager Phil Garner, replacing him with bench coach Luis Pujols. Then Dombrowski angrily confronted the team in a closed-door clubhouse meeting, the only time in his career he has done so. “There were issues that needed to be addressed,’’ Dombrowski recalled. Attitude issues, he said. 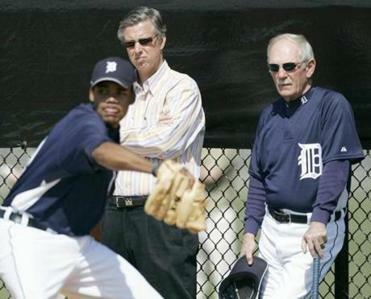 Jim Leyland rejoined Dave Dombrowski in Detroit for several successful years. Later came a couple of shouting matches with Leyland, who in 2006 became his fourth manager in his first five seasons in Detroit. To hire Leyland, he had fired a Tigers icon, Alan Trammell. Dombrowski managed to change the Tigers’ fortunes not only by hiring Leyland but by orchestrating several brilliant transactions, none more momentous than acquiring Cabrera and Dontrelle Willis in 2007 from the Marlins for six prospects, only one of whom, reliever Andrew Miller, now with the Yankees, has become a significant contributor in the majors. For all his success, though, Dombrowski fell short of delivering Detroit’s first championship since 1984. In two trips to the World Series, Dombrowski’s Tigers won only a single game, losing the 2006 Series to the St. Louis Cardinals, four games to one, and getting swept by the San Francisco Giants in 2012. Will Red Sox change philosophy under Dombrowski? Does Dave Dombrowski’s hiring mean a change in course for Sox?